Public Ad Campaign: Corporate Sponsored Pothole Repair! We all pretend like this is some magnificent act of altruism on the part of KFC, aiding our poor city governments in times of need. The fact of the matter is this is cheap advertising and logo placement. 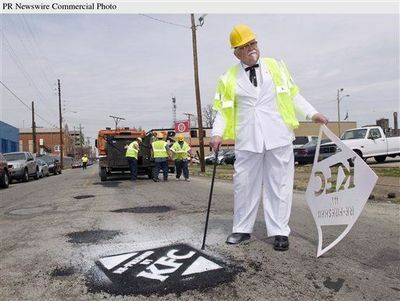 If KFC wanted to help the city they would just patch the potholes and move on. Ironically, an act of quiet benevolence would not go unnoticed and KFC would probably be greatly rewarded with good press and customer loyalty. You make me laugh Jordan. I think you and your "public space crew" should do more work like this. Until then, shut up or put up. Nick. I know our city infrastructure could use the helping hand of some corporate dollars and logos seems like a small price to pay, but can we not imagine alternatives. We are so used to having corporate identities sponsor every aspect of our lives that we forget the days when our government was able to care for our infrastructure on its own. As well, are there not ways we can allow a corporation to help our city, give them credit and promote their stewardship without plastering our city with their logos?